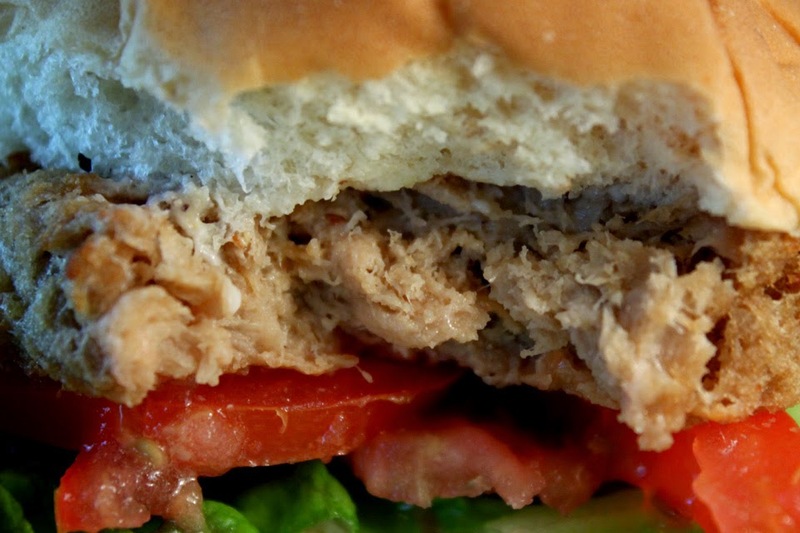 It's a tasty soy burger that comes cooked and frozen. All you do is zap it for a minute and a half and it's ready to eat. 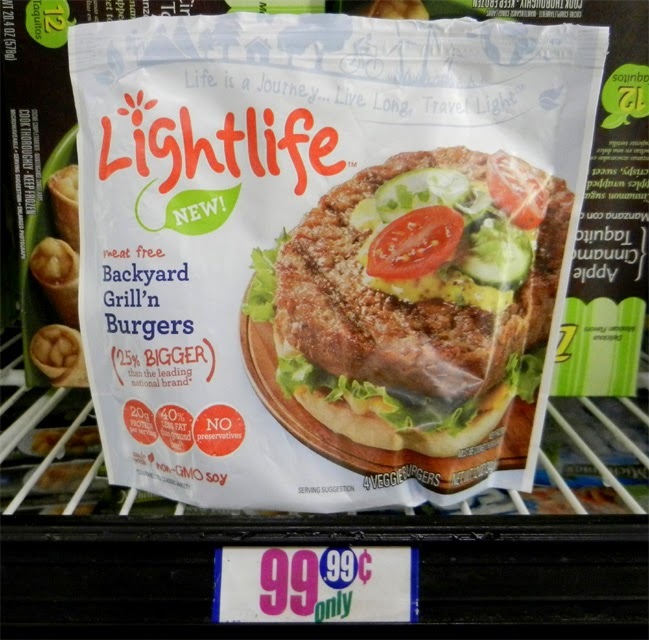 I'm wary of frozen factory-made veggie patties, but Lightlife Meat Free Backyard Grill'n Burgers were surprisingly savory. I got mine at the 99c only Store and the package holds 4 patties - a great deal. As I've pointed out before, this type of Deal of the Day is often only stocked for a day or two before they sell out. So I can't guarantee if you can find them. But if you see them grab a few bags. 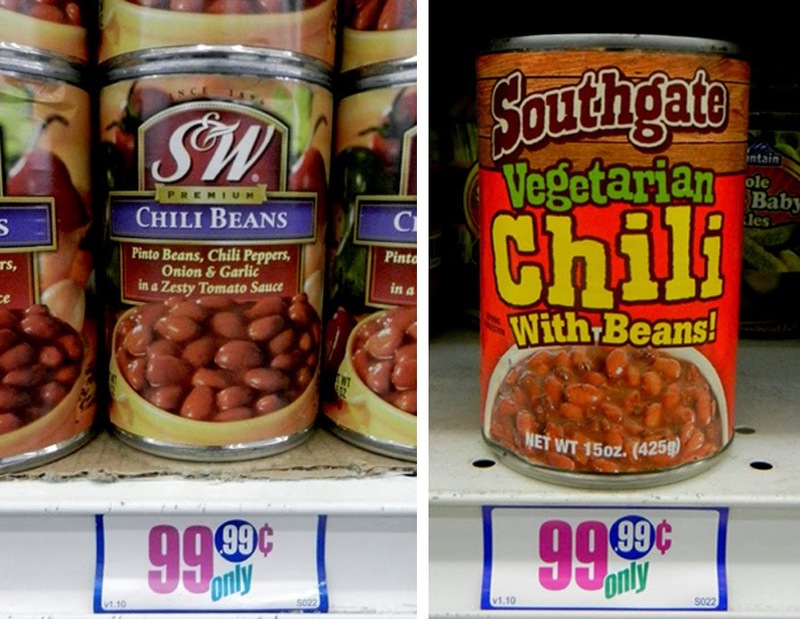 Even for a regular price at a typical grocery, it would be worth it. 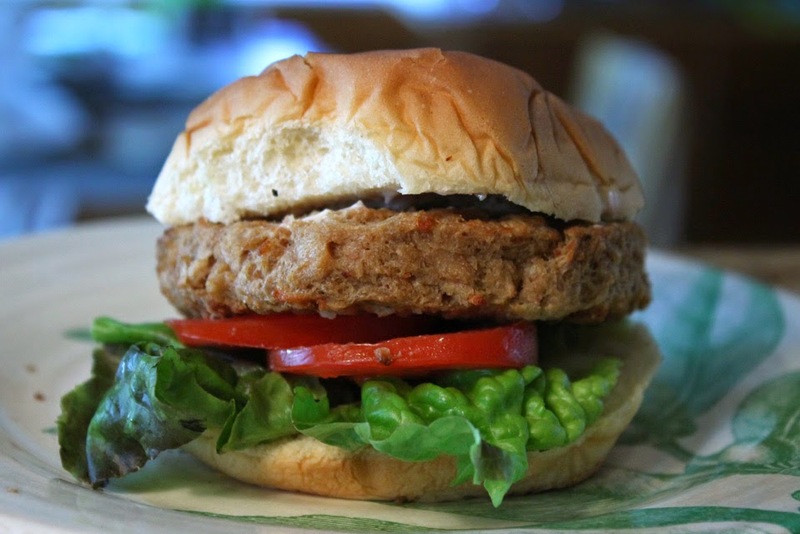 A delish soy or veggie burger is hard to find. Resting on a typical cheap burger bun, the soy patty was the right size and thickness. I dress my burger with mayo, mustard, lettuce and tomato. The soy patty microwaves fast, as it's already cooked. I covered the patty with wax paper to make sure it didn't dry out, if it defrosted early. I liked how moist the soy-veggie patty was. 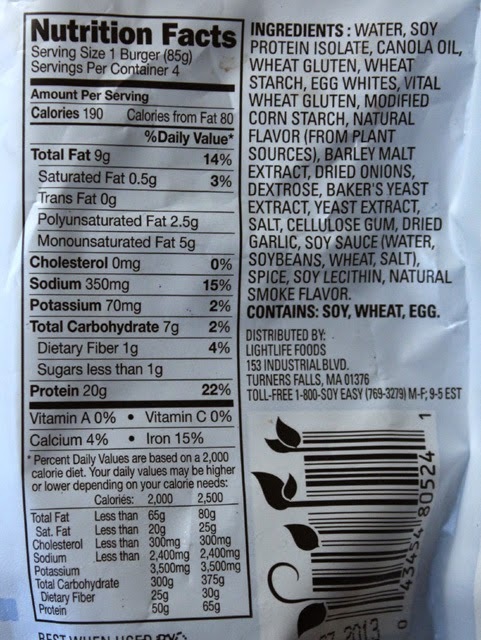 The main ingredients are listed as: water, soy protein, canola oil, wheat starch and eggs whites. Do eggs whites disqualify this burger as vegetarian? Overall I was quite impressed with Lightlife's soy patty. It reheats fast and is quite tasty. So on a Cheap$kate Dining Scale of 1 to 9, 9 being best, I give Lightlife Meat Free Backyard Gill'n Burgers an 8 ! 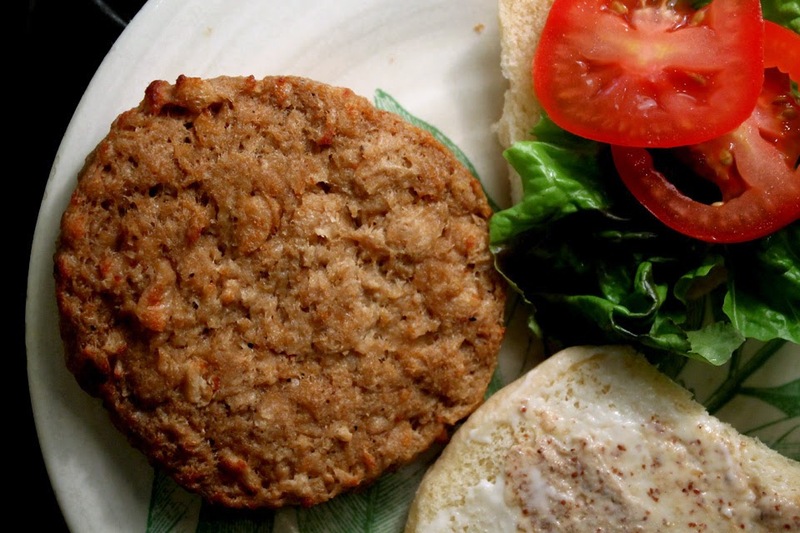 It is a good all-around soy patty, with enough flavor to satisfy a meat eater. 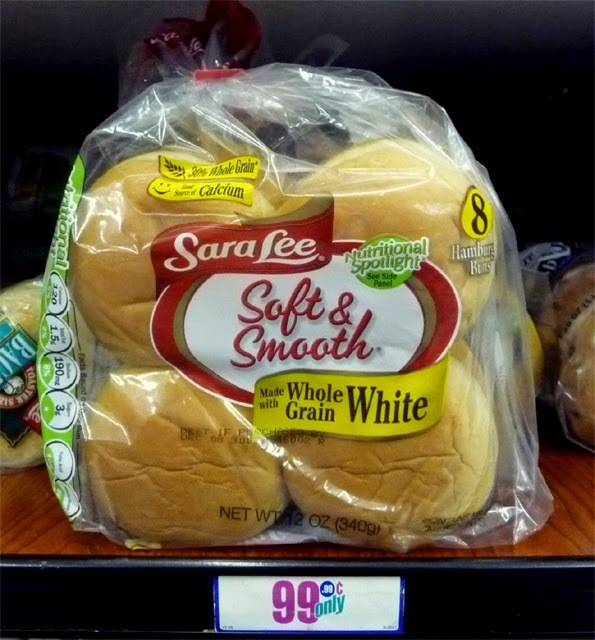 It's an excellent Deal of the Day. Our home base of Spider Rock Campground (see my video blog post, with links, here) supplied a tour guide at $75 dollars per person. 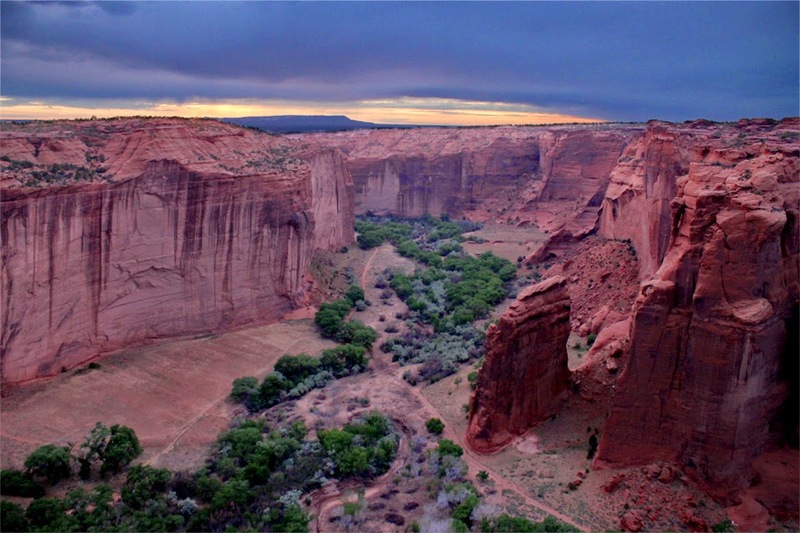 While quiet-spoken, our tour guide, Ben, shared many interesting stories about Canyon De Chelly. 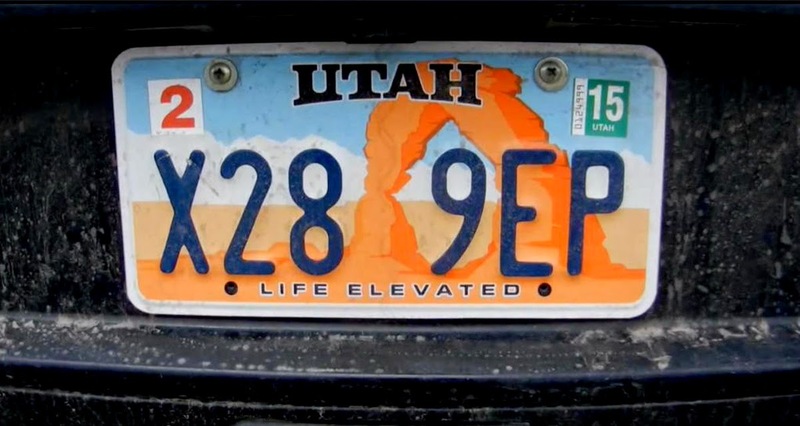 You check in at a ranger station then just drive right in. We brought a picnic, as the tour lasted half the day. 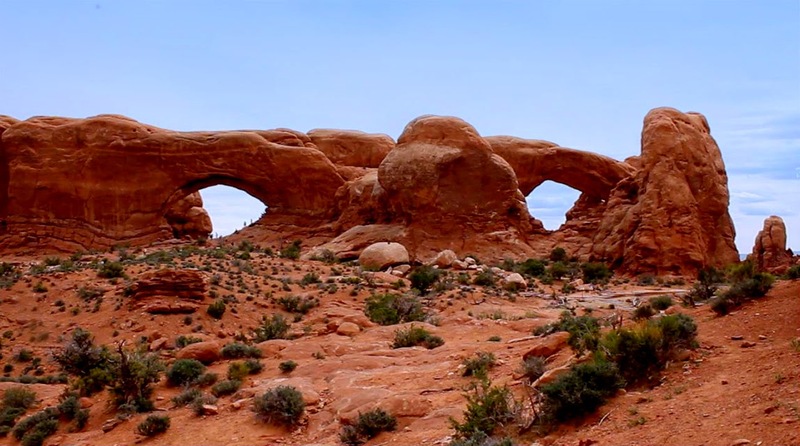 It's a fertile valley with 2000 foot (in parts) high walls on 2 sides. 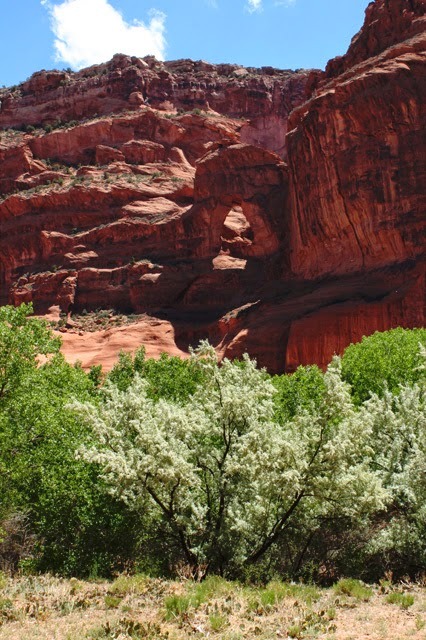 Many plants and animals trive here - while just outside of Canyon De Chelly the landscape is harsh and desert-like. Various Indian Clans have settled here over time. The valley floods during a short rainy season, but while we were there our tour guide only had to drive through shallow stream beds. 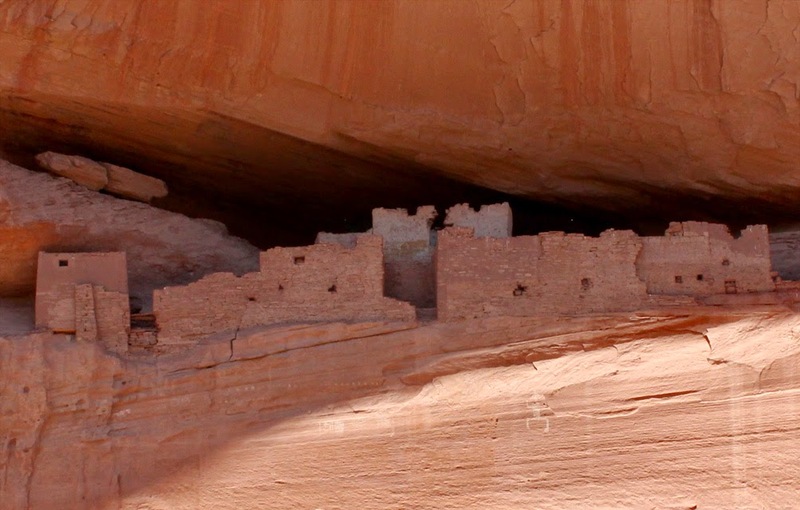 We made many stops to look at petroglyphs and ancient Indian dwellings. 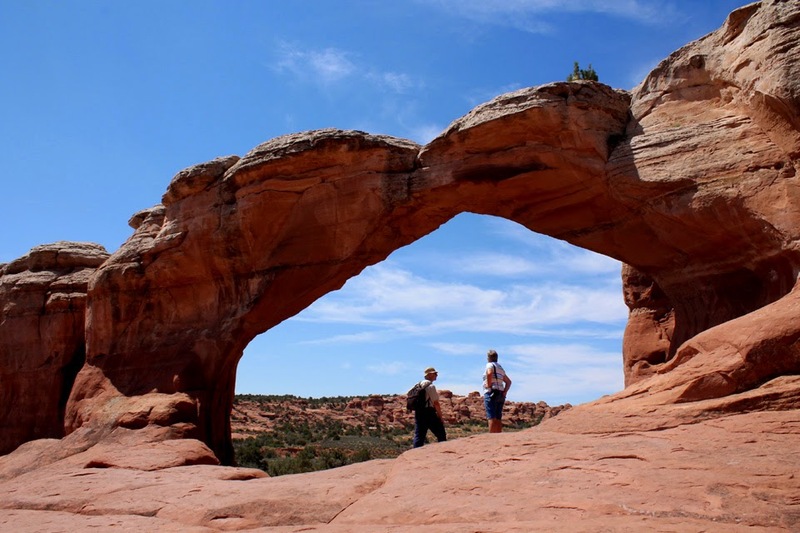 Make sure to bring binoculars as the cliff dwellings are almost impossible to reach. 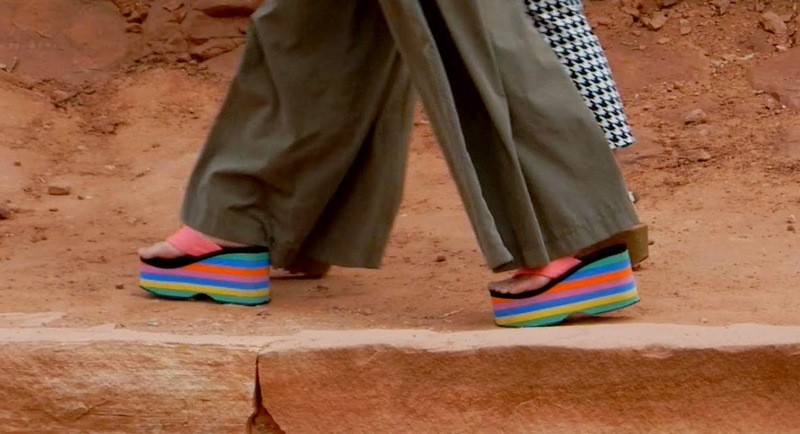 Even the original inhabitants had to build long ladders to climb to the stone pueblos. 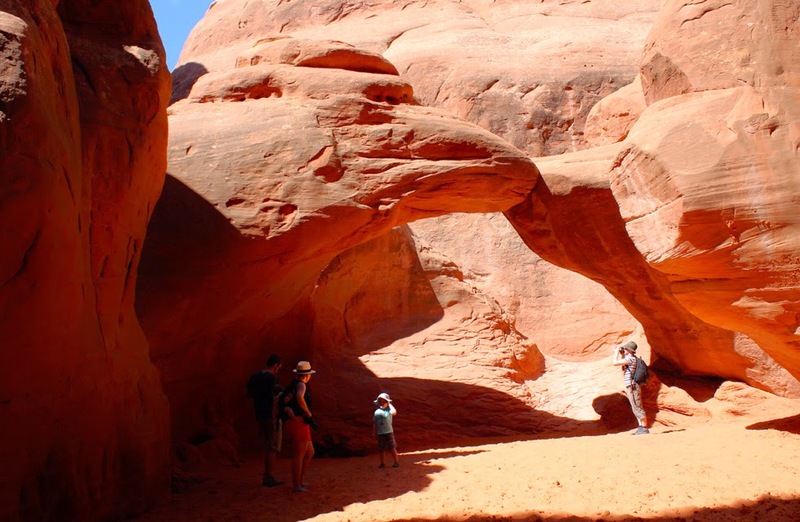 The ocre/red sandstone walls drop straight down with natural caves and ledges in the shear walls. 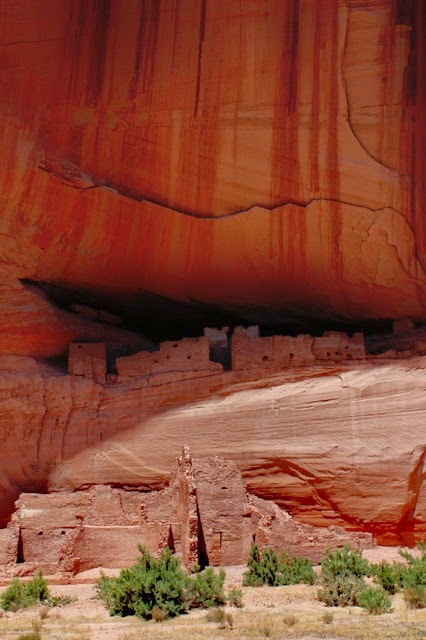 Ancient peoples carved-out and built structures in the cliffs thousands of years ago. 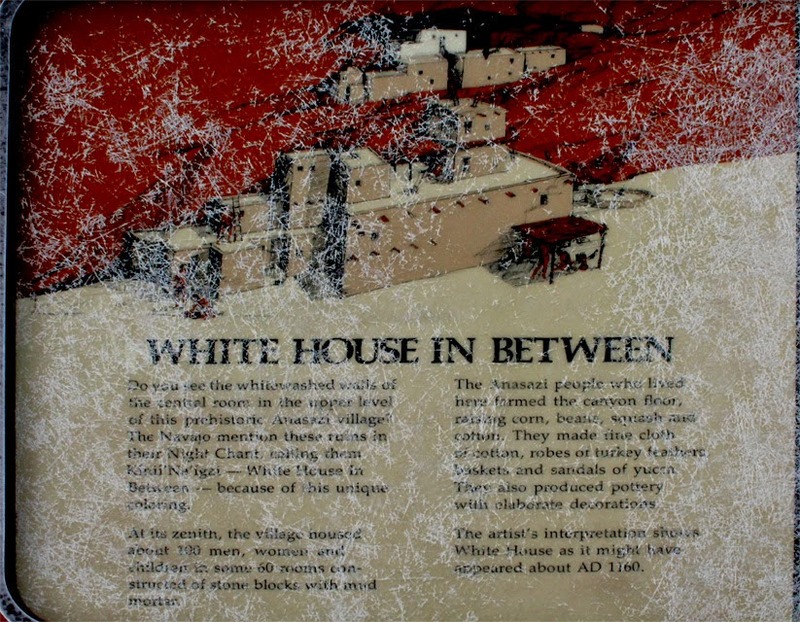 The White House Ruins is one of the main stops. 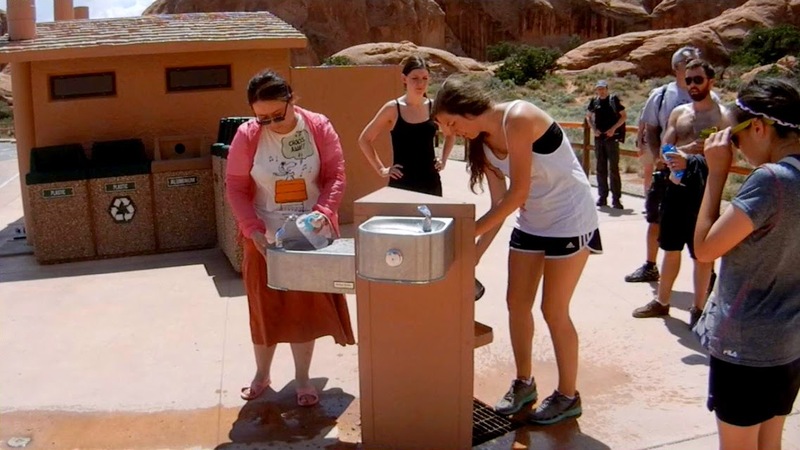 There are water stations and restrooms nearby. 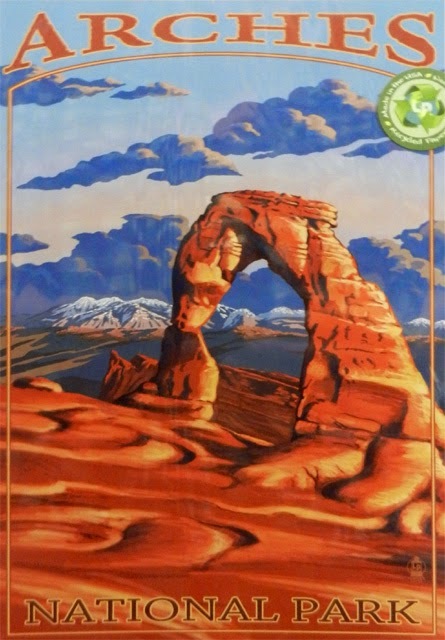 Gift tables manned by local natives carry all manner of jewelry, pottery and clothing. 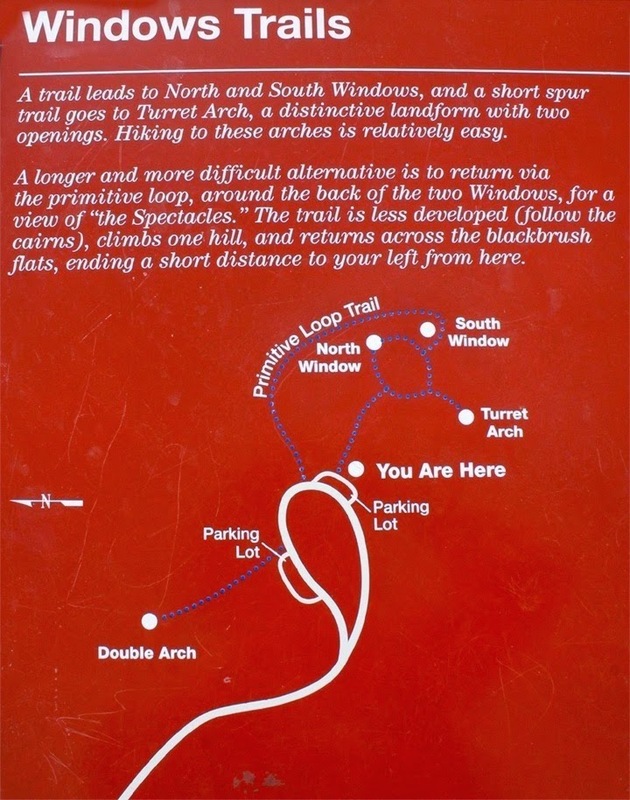 You can walk a trail to get closer, although we did not do it. Waves of different Indian Clans have taken refuge there. 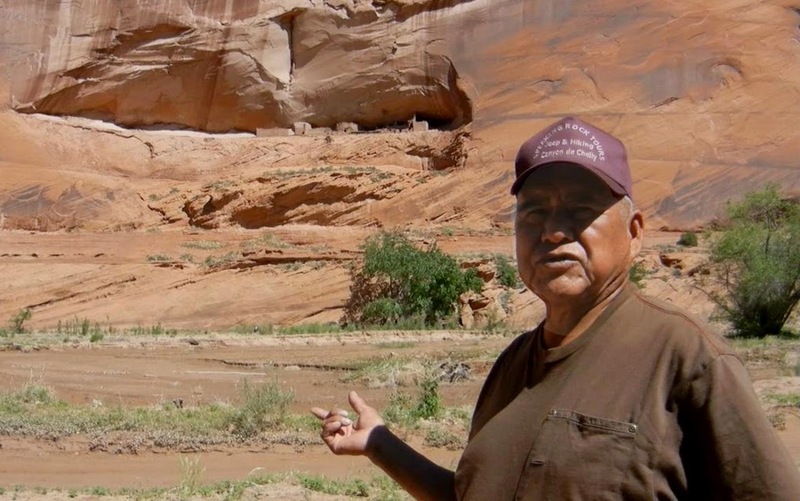 I asked out tour guide why anyone would live in the side of a cliff, he said it was because of the floods and wild animals (and probably to keep enemies at bay.) 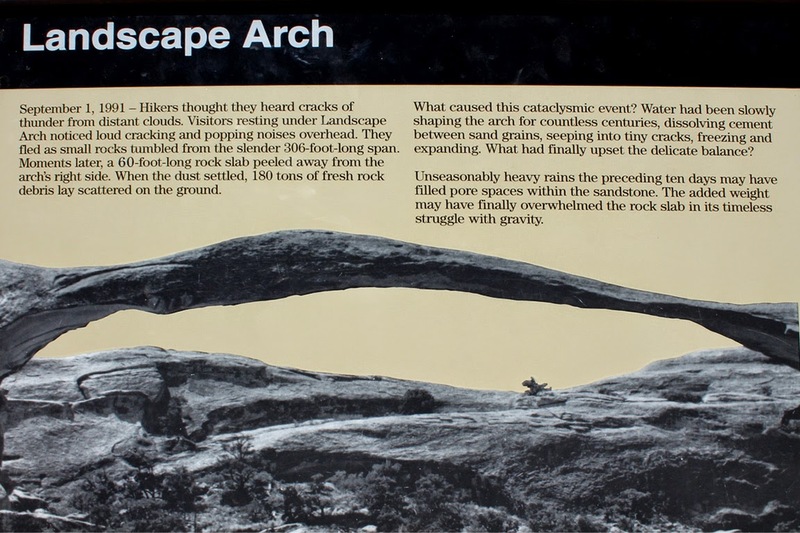 Another blogger describes a hike to the ruins here. 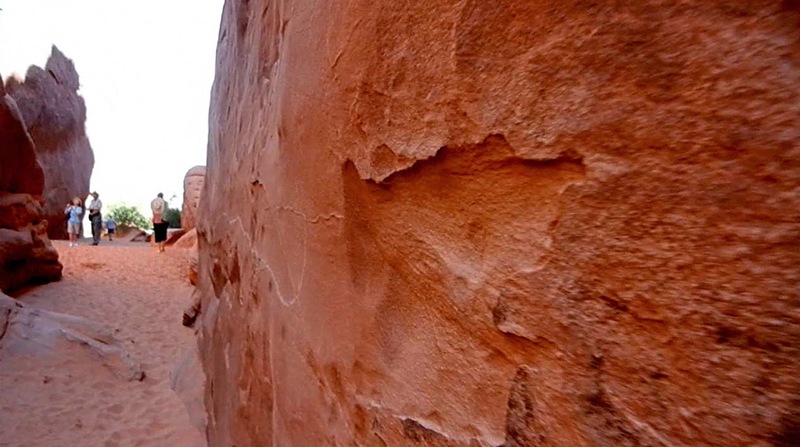 Driving along the majestic high walls puts you in humble space. 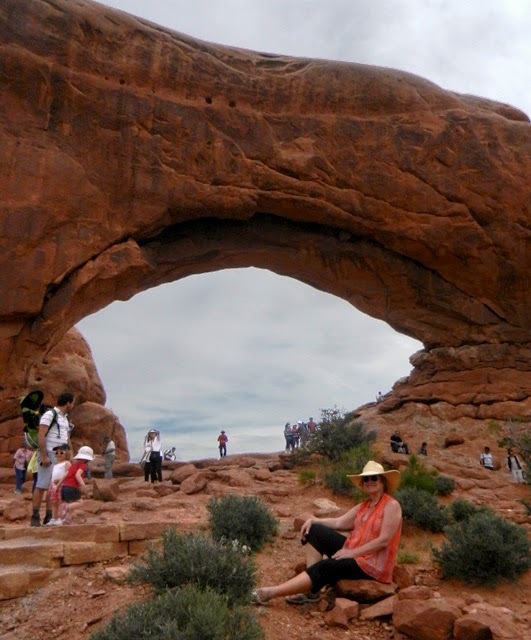 We even passed a sandstone Arch or two. 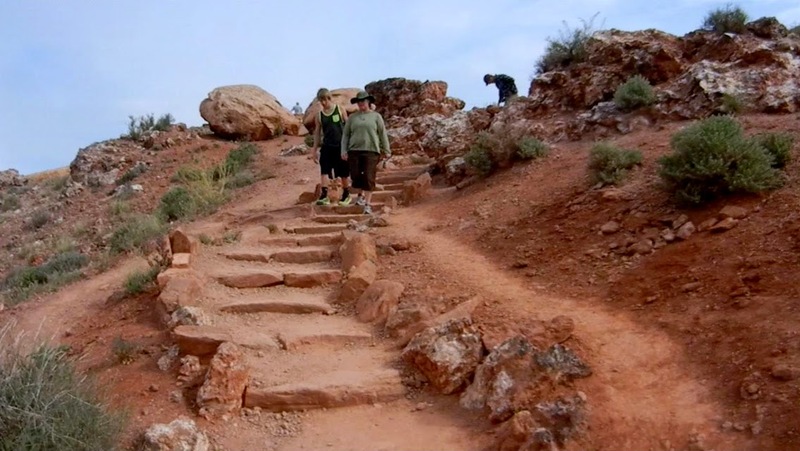 At the end of the trail was Spider Rock. 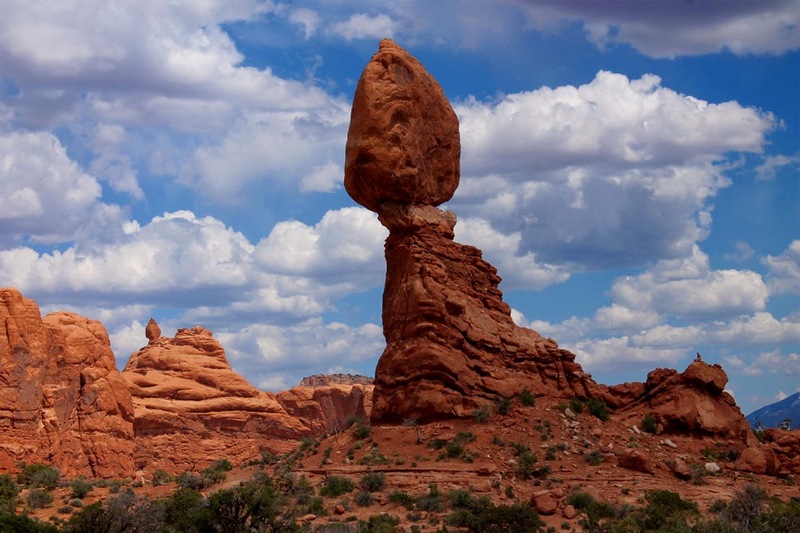 At about 800 feet high, it looks nothing like an arthropod. 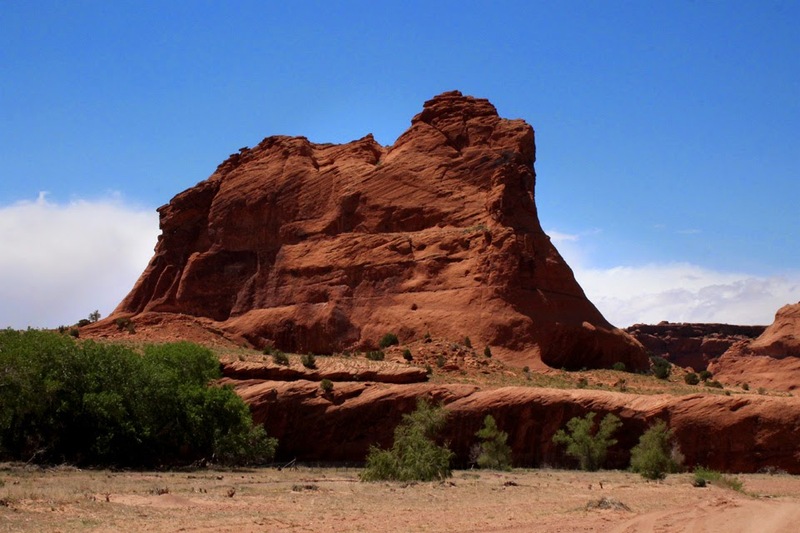 The spectacular red sandstone monolith is said to be the home of Spider Woman, an ancient Navajo Deity, click here to read about the legend. 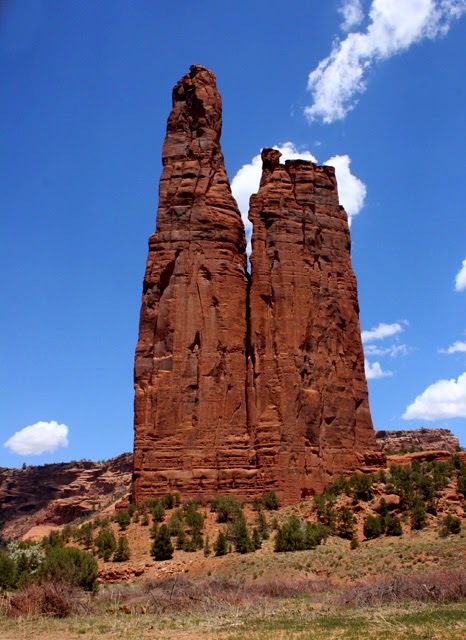 Spider Rock is indeed awesome and we stopped to have a picnic under the trees nearby. This was the end of the valley tour for us. We packed the leftovers and headed back. That's it. My Indian Vacation Series is over, but you can return anytime to view all 9 blog post and videos anytime. 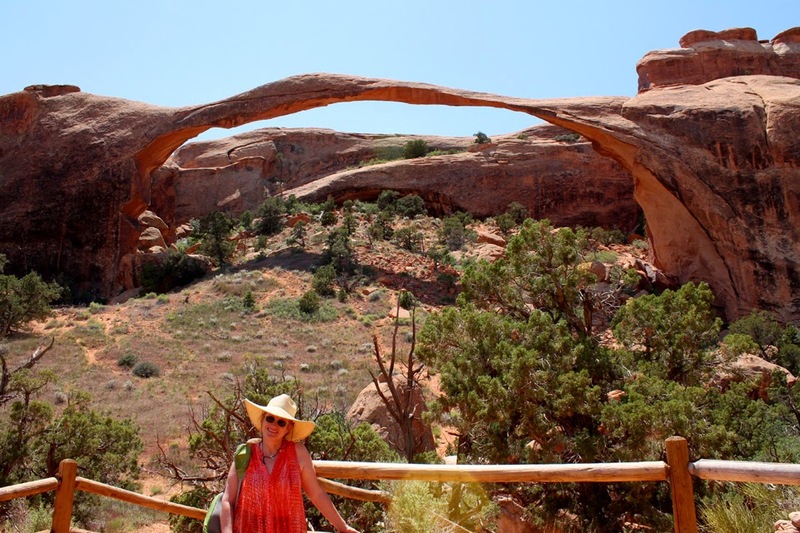 A big 99 thanks to my wife, Amy, for arranging and booking the trip (and for being a fun travel mate,) plus all the cool tour guides, park rangers, and friendly and informative local Native Indians, for showing us the way. 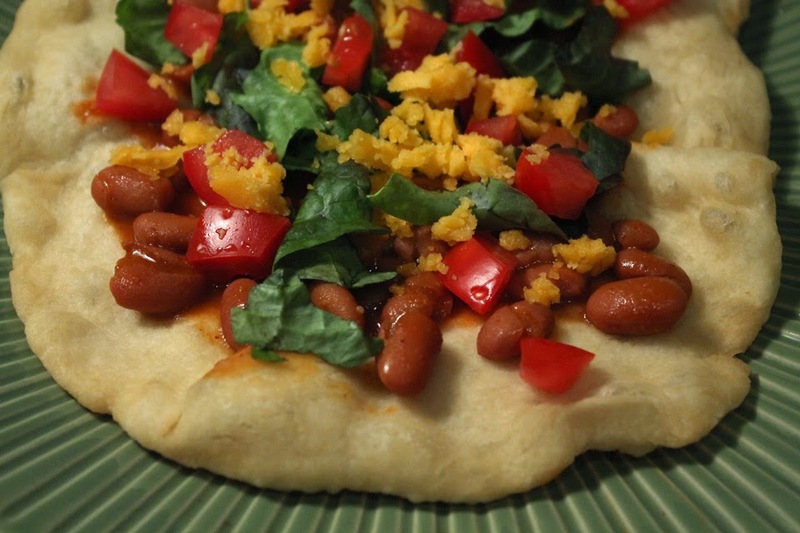 Leave it to American Indians to come up with a delicious dish that looks like a Mexican pizza: a Frybread Taco. 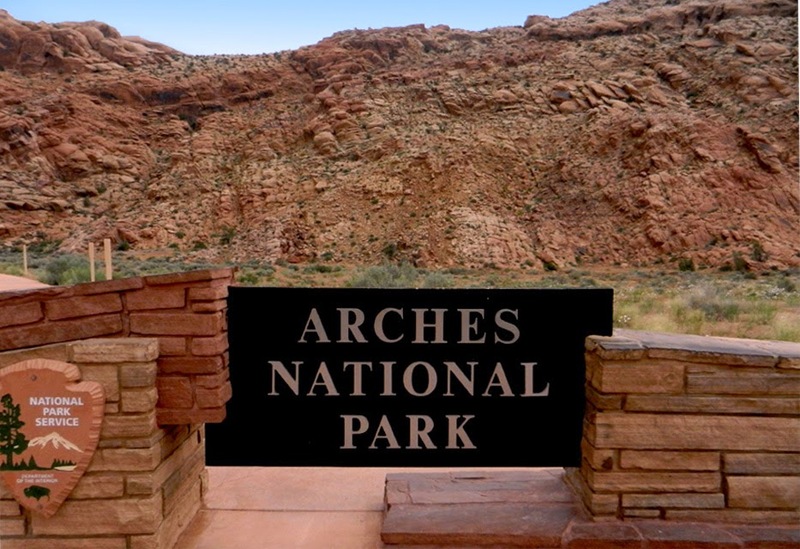 I had a Frybread Taco during a lunch stop on the way to Arches National Park. It's similar to a humongous Americanized taco, but on a fluffy, airy round of pizza-like crust - really quite tasty. 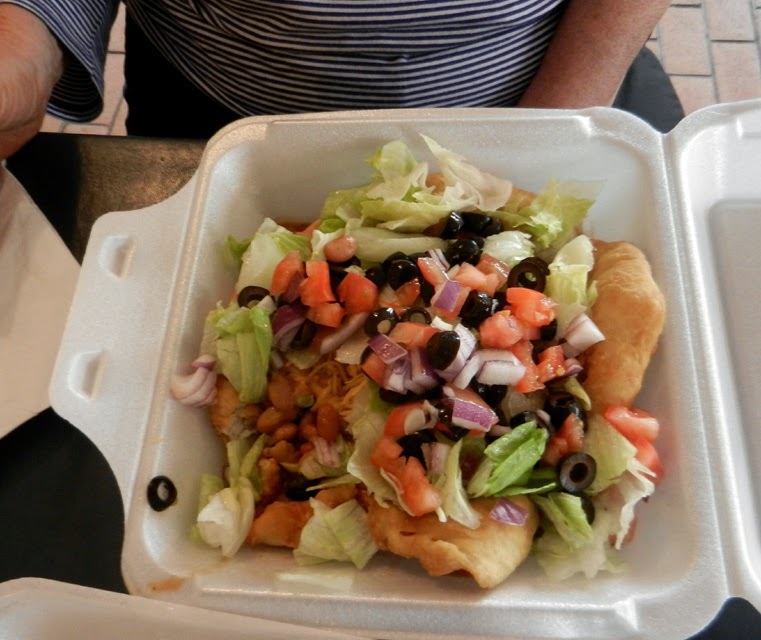 All the typical ingredients seemed simple enough to assemble, just ground beef, beans, iceberg lettuce, tomato, onion, grated cheese and sliced black olives, on a slab of Indian Frybread. For my version I left out the beef, olives and onions, but you can mix and match almost any favorite taco ingredients you like. Do you want meat on your taco? I have an easy and quick recipe for that right here. 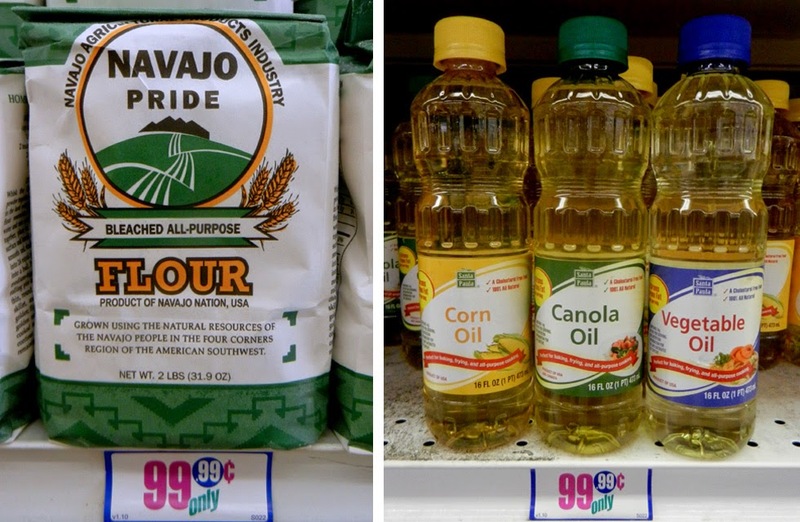 Flour, baking powder, water and oil, that make up Frybread, are cheap enough. I made this entree vegetarian and all the toppings fall within my 99 cent mandate. As I mentioned above, you can make it with ground meat, while that is an inexpensive protein, it's still over my budget. If you have been following my Indian Summer Vacation Series then you've seen my Frybread Video Recipe from a few weeks ago. Just click here to see it - but I do explain the recipe below as well. 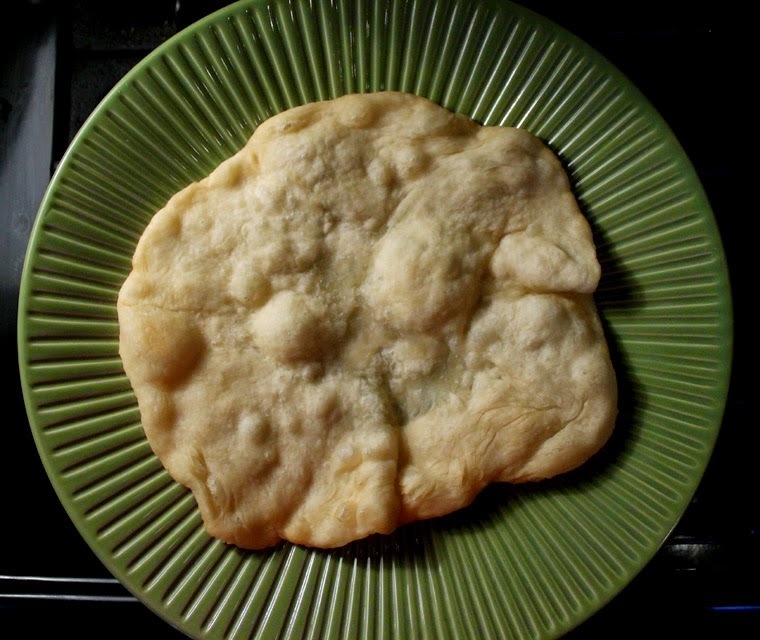 Frybread is light and tasty, kind of a cross between a flour torilla and pizza crust. They are on the large size, about 8 inches across, so one Frybread Taco is almost enough for a meal. My recipe makes enough for 2 Frybread. The main topping ingredient for this taco are Chili Beans. 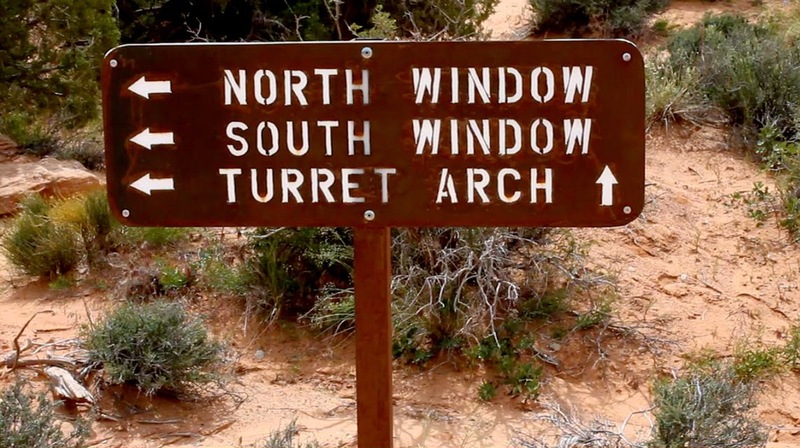 I take a shortcut and use canned. 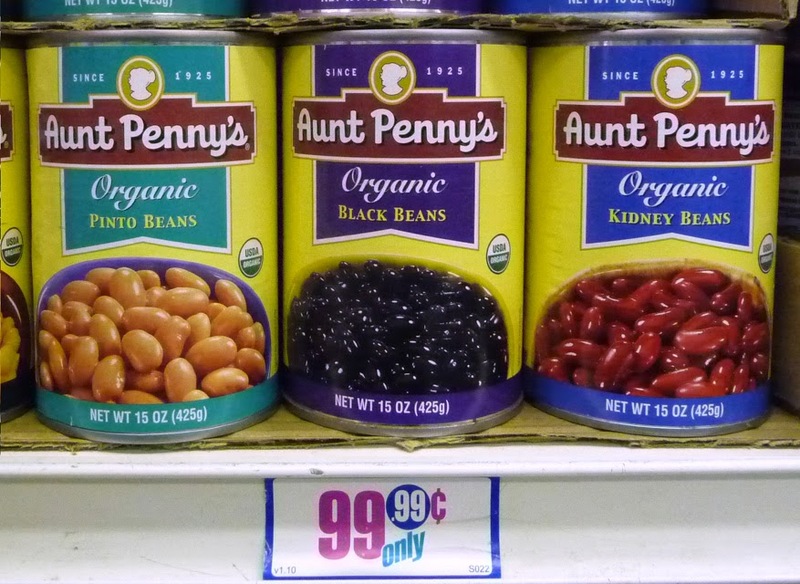 Also, you can also use any favorite canned beans, like pinto, chili with beans, red or black beans. 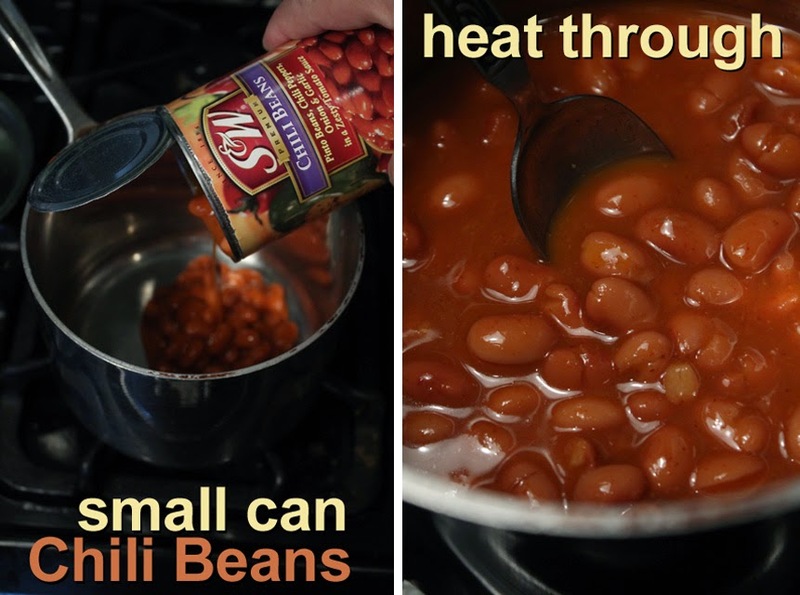 If all you have are red beans or pinto beans, try adding half a teaspoon of chili powder. And you can use nutritious spinach instead of iceberg lettuce. Frybread right out of the frying pan is delectable and you should try it once, even if it is made with white flour and deep fried like a doughnut. (You can substitute whole wheat flour instead of white.) It's a delicious indulgence. 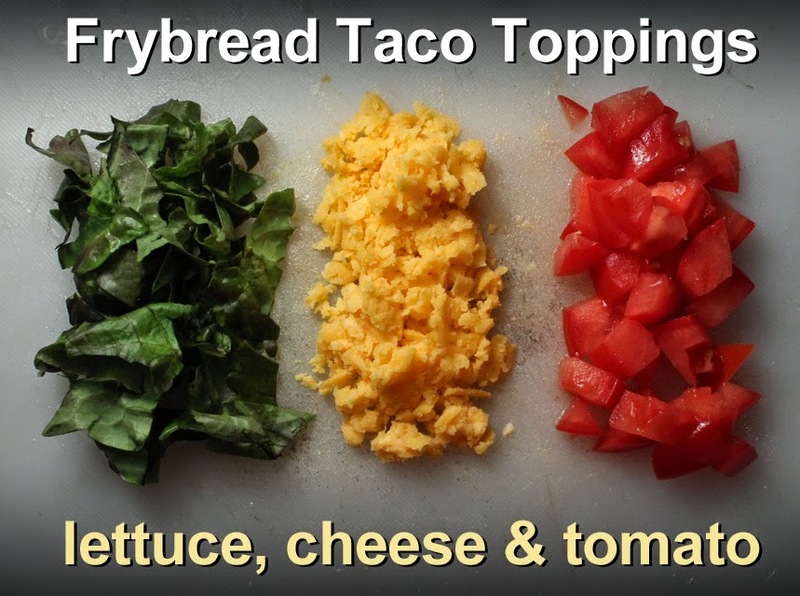 So give my Frybread Taco a try, it's a unique taco and looks good on the plate. 1 1/4 cup of flour - okay to use wheat flour. 1 teaspoon baking powder - it makes the Frybread blister and puff up. Vegetable oil for frying - any favorite. Most recipes call for lard or Crisco, you can use it, if you want to. Chili beans, chopped tomato, lettuce (or any greens) and shredded cheese. Other topping include: sliced black olives, onion, avocado, taco-style ground meat (recipe here,) pico de gallo (recipe here,) and of course, hot sauce. Add flour and baking powder to a large bowl. Mix well. Pour in water and begin to stir with a spoon or fork. As dough comes together you will need to get your hands in there to form a dough ball. If the dough is sticky when all mixed together, then sprinkle on a teaspoon of flour and fold the dough some more. 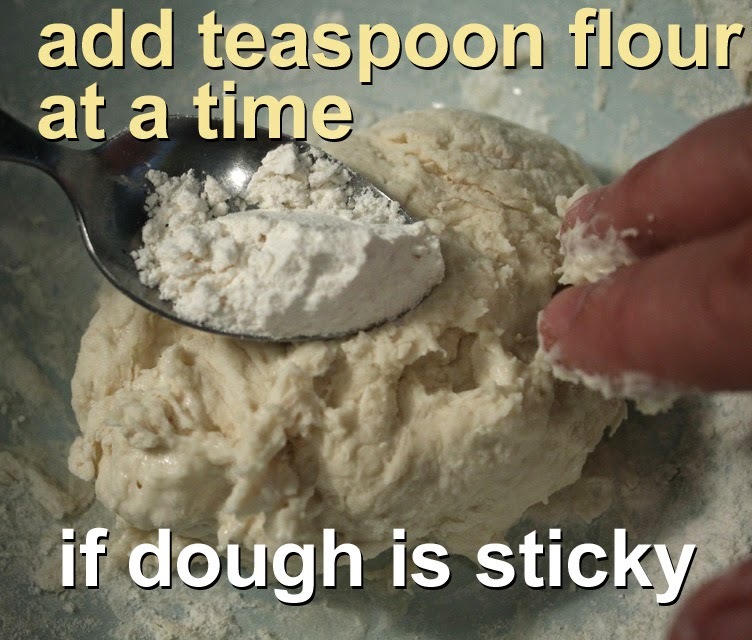 You shouldn't need more flour than a couple of teaspoons.You only need to mix and fold the dough for a couple of minutes, total. When dough if well mixed together, pinch it in half and form 2 dough balls. At this point you can chop any veggie toppings and set them aside. I used tomato, red leaf lettuce and cheddar cheese. Start the Chili Beans heating in a pot (or zap them in a microwave oven.) I like to get all the topping ingredients ready to assemble when the Frybread comes hot out of the oil. 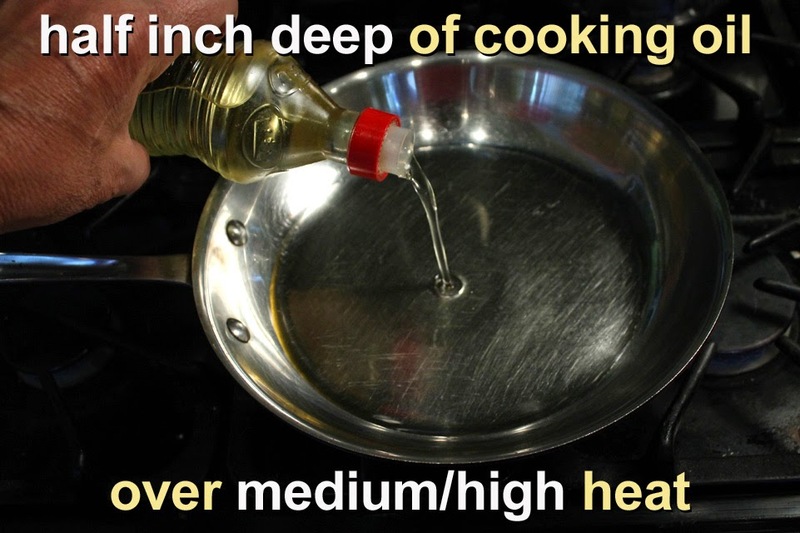 Add oil into a frying pan that's at least 8 inches across. Add enough oil until half an inch deep. You want enough for the Frybread dough to float when cooking. Start with a medium/high heat for frying. While oil is heating make the Frybread rounds. Sprinkle a little flour on a board or counter. Spread it out about 8 inches around. 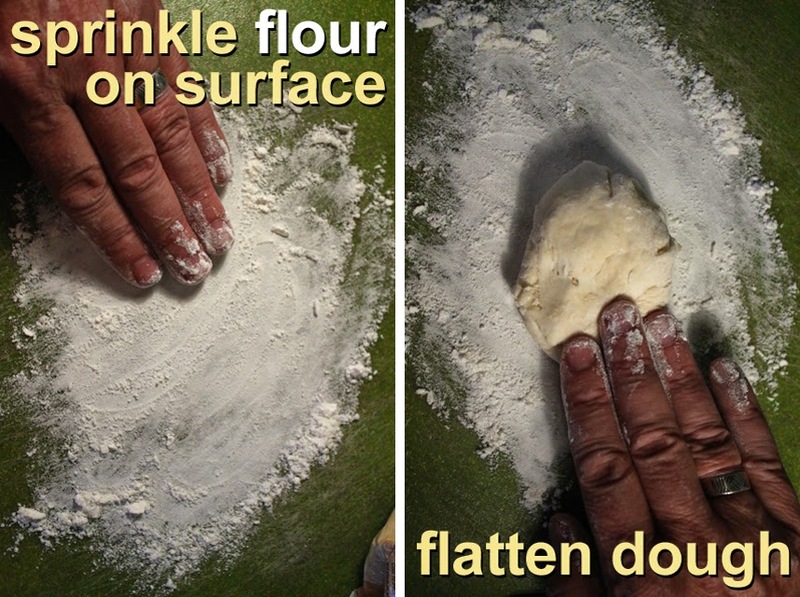 Lay out one dough ball and flatten with your hand and fingers. 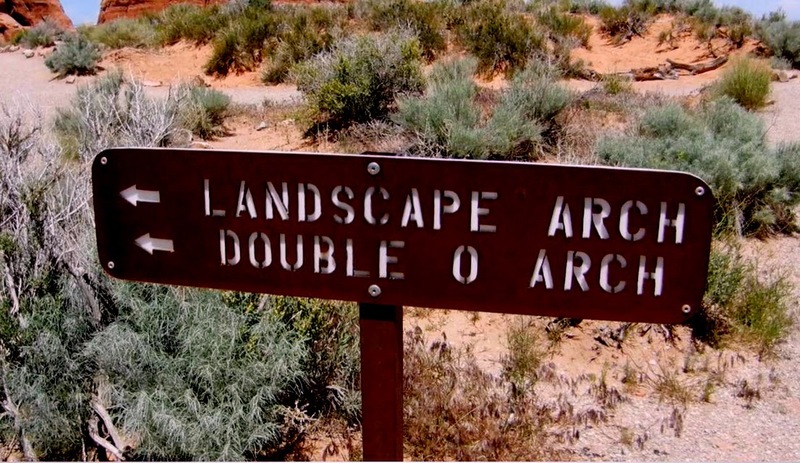 Start from the center and work your way outward. Keep pressing until you get a tortilla shape. It doesn't have to be perfectly round, the main thing is to make it thin without tearing (or taco fillings will fall through.) It should be similar to thin crust pizza. Repeat the shaping steps on the other dough ball. Now time to fry it up. Pinch off a small piece of dough and drop it into the now hot oil. The dough should immediately bubble and float. Be careful as you are working with hot oil. If you have a frying thermometer the temperature is about 375 °F (190 °C.) I just guess, with my heat controls in the medium/high range. Spoon-out the dough piece. 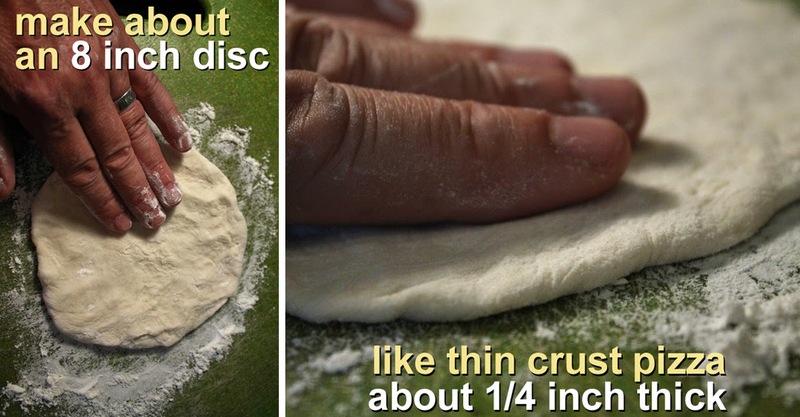 Use both hands to pick up the flatten dough and slowly add it to the hot oil. Again, be careful when working with hot oil. The dough will bubble and quickly float. The dough cooks quickly, no more than 30 seconds to a minute. Use a metal spatula or fork, and lift one edge of the dough to check that the Frybread is stiff - that means it's read to be turned over. Turn the Frybread over and cook another 30 seconds or so. That's it. 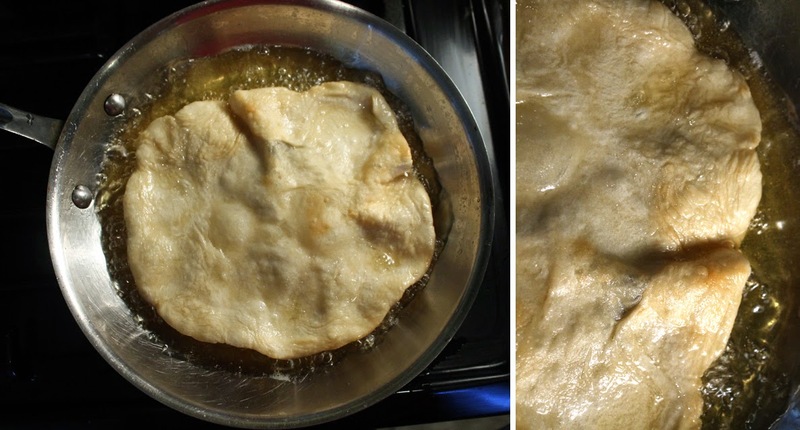 The Frybread doesn't have to be browned like a doughnut - you may get a few light brown spots. 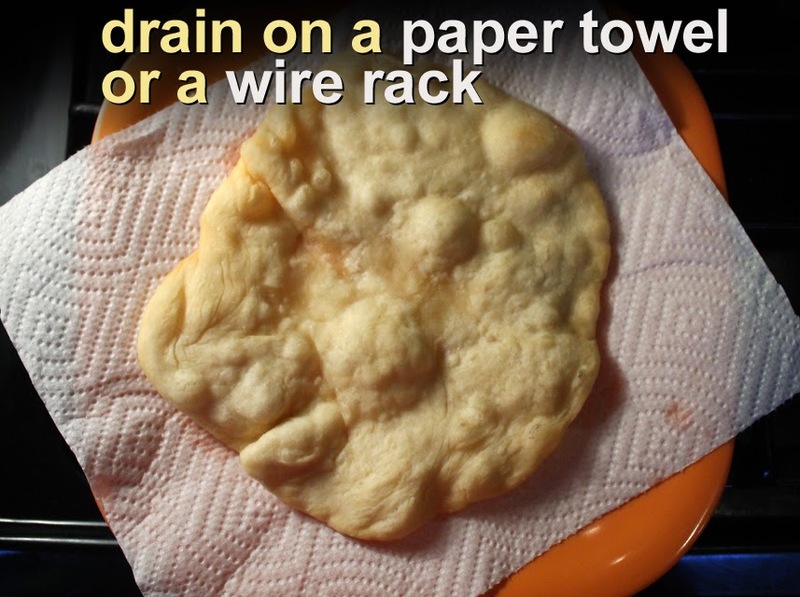 Now just lay the Frybread on a paper napkin, or a wire rack, to drain off the oil. Repeat the same frying method for the other dough ball. It's best to assemble and eat the Frybread Taco while it's still warm. You can add the toppings in any order. I like the beans on the bottom then add the rest of the toppings. If you want melted cheese then add that on the hot beans, followed by the other ingredients. The balance of ingredients is up to you. Add a lot of beans or just a little. Double up on the cheese or veggies. It's all to your taste. 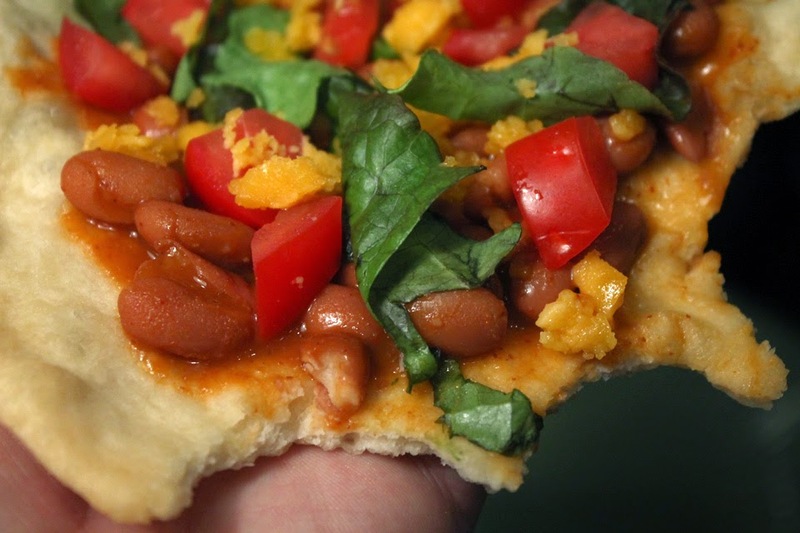 Now just eat the Frybread Taco like you would a big slice of pizza. 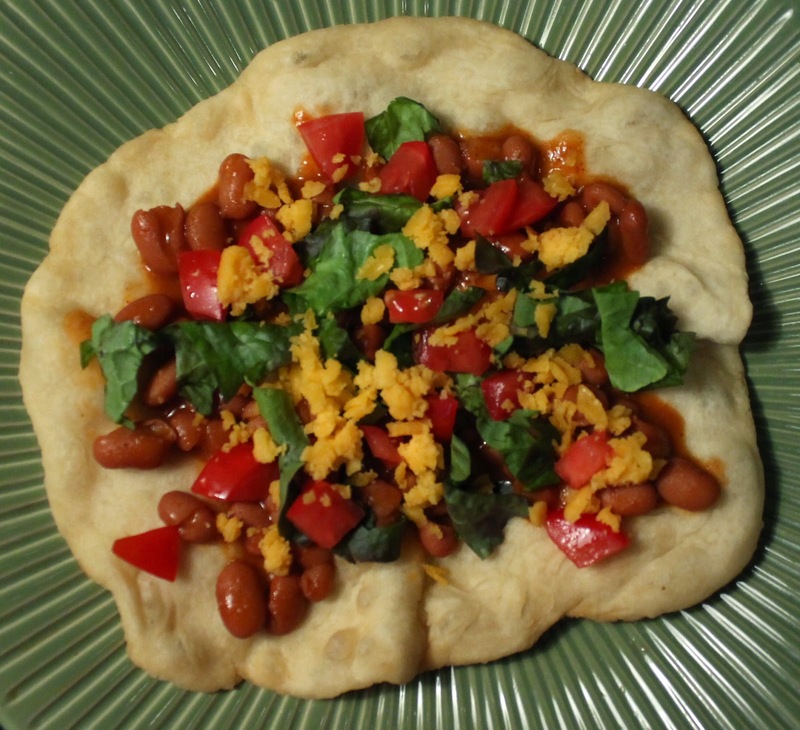 It's easier to handle than pizza, as Frybread is stiffer - somewhere between a saltine cracker and a soft tortilla. As I mentioned earlier, you can use any favorite taco toppings like: black olives, avocado, onion (white, yellow, red or green onion,) sour cream, pico de gallo salsa (recipe here,) hot sauce, etc. 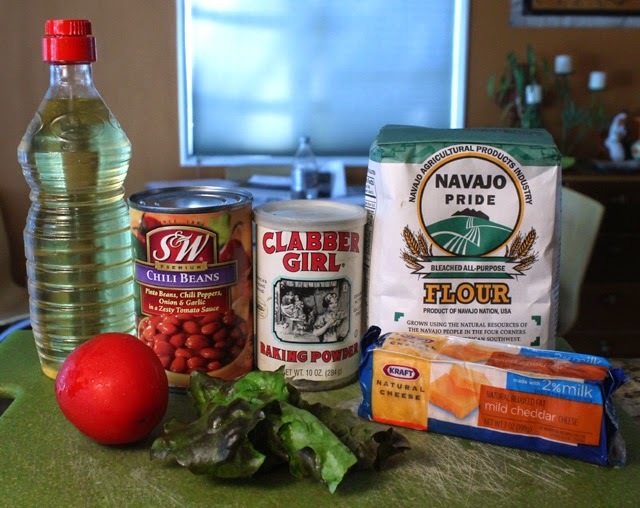 And my Frybread recipe is easy to just double the ingredients to make more. Also, I reuse my oil, so when it cools down and the flour sediment has settled to the bottom, I pour it into a large pickle jar (cleaned and dried of course) for use on another day.